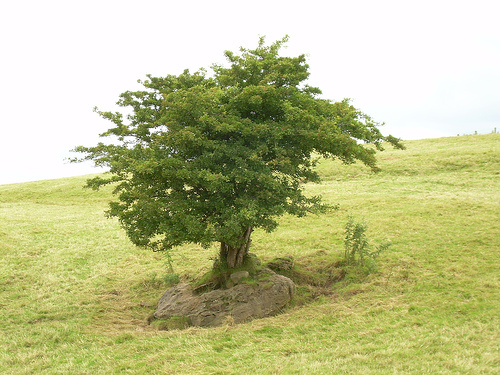 As you travel through Ireland, you will often see small, gnarled trees or bushes, hawthorn (also called whitethorn), standing alone in a field or by a road. These are fairy trees. Don’t mess with them! “Whether you fall under the heading of hedge planter or fairy hunter, here is how to identify our native hawthorn, when out and about. A bushy tree, hawthorn grows on average, to a height and spread of 6 meters. Unlike blackthorn, whose stems are dark, the stems of hawthorn are light grey turning to a pinkish brown color with age, which is also when character-filled cracks start to appear up along the trunk. Most of the young twigs sprouting from the tree emerge red before going through these color changes. The glossy green leaves are between 20 to 30 mm long and are divided into 3, 5, or 7 deeply cut lobes. The tree comes into leaf at the end of March. 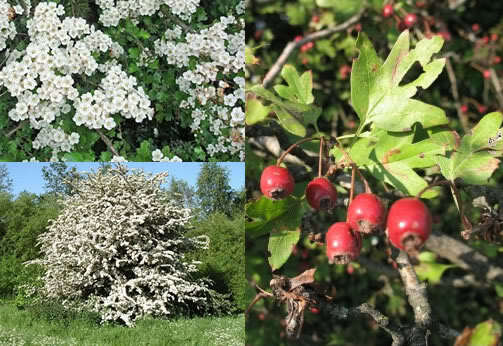 Hawthorn is in flower from May to June with 5-petalled white flowers, which unfortunately have an unpleasant smell. You see, up close, the flowers have a faint scent of rotting meat; this allows pollination of the flowers by flies rather than the bees, which are not active in early spring, Hawthorn’s blooming time. Hawthorn is all around us in the countryside, so if you live there or have spent some time there without being put off by hawthorn’s spring scent, then you won't find it unpleasant. Flowers that smell faintly of rotting meat. Charming! Please feel free to comment, but keep it clean. This is a site (mostly) about books for kids after all. Thanks! I am a Canadian writer living in Ireland. I write stories for kids of different ages. Oh, and it seems that baby rabbits are called kittens! All content on this blog is copyrighted by A. Colleen Jones and cannot be reproduced without permission. Thanks!